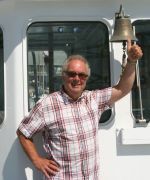 Hello, my name is Cas Pijpers and I’ve been in the boating industry since 1980. I’ve worked in recruitment for Ship Yards and the Offshore-Petro-Chemical industry for about 25 years. The next 10 years I had a yacht parts web shop in Holland, and worked with my service company for luxury yachts in the repair-maintenance industry in several European countries. My first boat was an Ecofiber speedboat with a petrol BMW engine and later I bought a Fairline cruiser. But after a few years I chose a job of bigger magnitude and bought an 18-meter coastal Tug boat (1939) with an original Demag-Modag 2-stroke air started engine. I sold this boat in 2007 because I bought a fantastic 24-meter ex Royal Navy Fleet Tender, with a beautiful Lister Blackstone 4 cylinder-750 RPM turbo charged engine in 2006. I did a major 2 years refit and sailed this ship in 2012 to Barcelona, were I lived with my family for 6 months aboard. From 2013 till 2017 we run a very successful B&B on this boat. Due to our moving to Valencia we sold her in December 2017. Since 2012 I’ve been living with my family in Spain and worked daily with boats! With SOS Ship Outlet Store, my aim is to offer boat spares, yacht accessories, motor parts and sailing equipment for the best prices possible!